This incredible and distinctive bomber jacket is inspired by Michael Jackson. This red and black Mickey Mouse’s bomber jacket is crafted of Wool material and its lining is made of viscose. MM’s jacket comes up in a feature such as turned down collar, front button closure, two front pockets and knit wrist cuffs. Moreover, the most incredible feature is that it has Mickey Mouse’s print on its back. 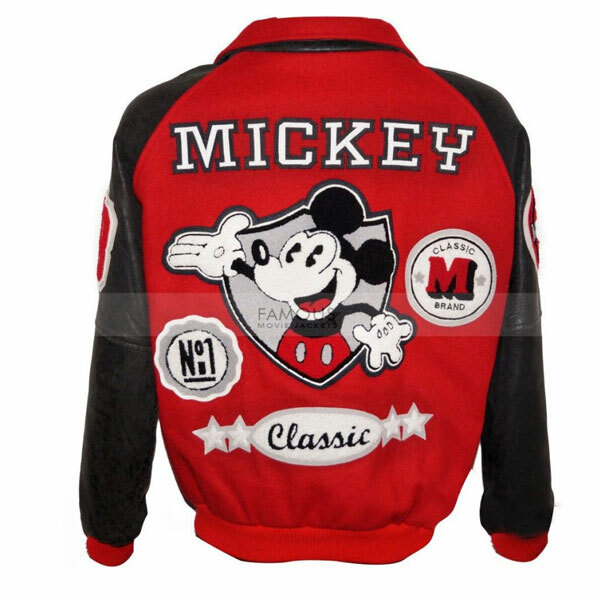 Michael Jackson Mickey Mouse Club Red Varsity Jacket is the best pick for your casual look. And you can also wear it fancy dress party as well. Now you can customize your order according to your size. Grab this classy attire and enhance liveliness in your personality. Michael Jackson always my favorite Hollywood actor I choose this attire bcoz I like features and style pattern. In fact, the quality is much superior and keeps me warm constantly. Fortunately, I got my jacket in a perfect size before 2 days of delivery time. This is quality valued price for me. So guys must try it! I got this Mickey Mouse MJ Jacket from this store and trust me this is so slick and very much sewed. I thought to make a request again in light of the fact that I cherish the quality, front part as well as affection the inward quality. Much obliged for the trustee administrations too. I customized this jacket for my son. He was happy so as I. thank you. When I first saw this jacket on your website I just said wow I want this. This is something I wanted for a long. But I got this jacket bit late but it is remarkably best in fitting and size. Happy to get my order  thank you.